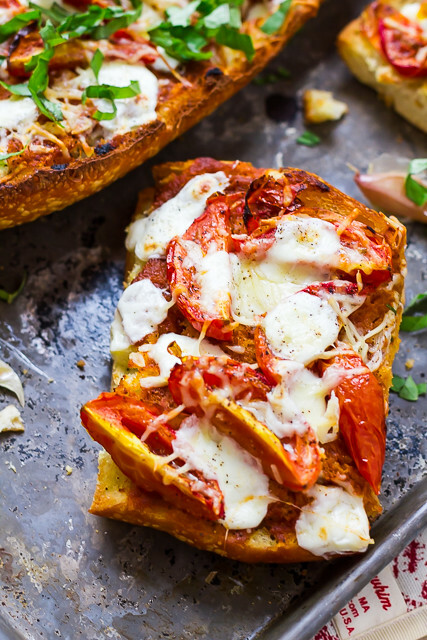 Who else has succumbed to TOMATO AND BASIL AND MOZZARELLA ALL OF THE THINGS? Tis the season! The garden finally relinquished its hold on the first tomatoes of the year (could it have *BEEN* any slower?!) and now around here, everything is getting the tomato and basil treatment: burgers, pasta, and of course: pizza. 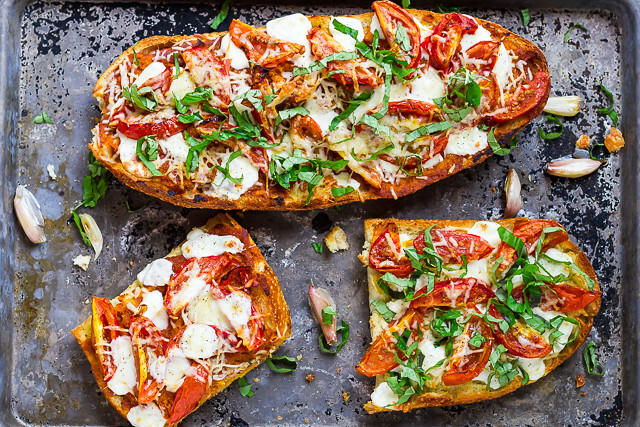 There’s not really anything you or I need to do to improve upon a good margherita pizza. A handful of simple, classic flavors always make the best dishes. But those flavors become exponentially better during the late spring and summer when tomatoes are at their freshest, even more so if they’re coming straight out of your backyard. We tried out a new-to-us pizza place a couple of weeks ago – one of those assembly-line-burrito, build-your-own pizza places. It was good – I mean, it was pizza. And there, among countless bins of pizza toppings, was a vat of roasted garlic cloves. Yes, I doubled-up. And yes, I slept alone. So when it came time for pizza night, I broke apart a head of garlic and roasted it to sweet perfection and then used the mashed cloves as the base for margherita pizza. I know, right? Happy Tomato Season, all summer long! 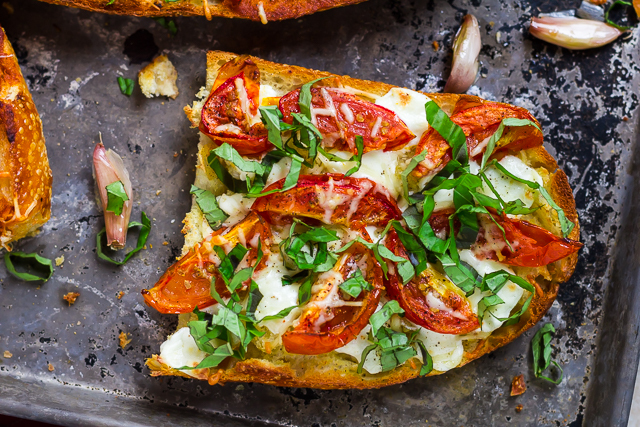 Roasted garlic, summer tomatoes, and fresh basil top a fresh loaf of french bread. Place the tomatoes on a large foil-lined baking sheet and drizzle with olive oil; season with salt and pepper. Take another sheet of foil and fold it in half for double-thickness. Top with the garlic cloves and drizzle with olive oil on one half of the foil. Fold the foil into a pouch and place it on the baking sheet. Leave the oven on and remove the pan. Let the garlic cool for ~10 minutes and then open the pouch and peel the cloves. Transfer the tomatoes to a plate or bowl and discard the foil - wipe up any liquid off the pan and put the bread, cut-side-up, in the oven to toast for ~5 minutes. Sprinkle the cloves over the top of the bread and, using a fork, mash and spread the roasted garlic all over the toasted top of the bread. 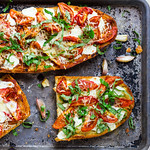 Sprinkle with mozzarella, top with the tomatoes, and then sprinkle with Parmesan. Bake for ~7 minutes, until the cheese is melted. Stack the basil leaves, roll into a cigar shape, and then thinly slice the leaves. Top the pizza and enjoy. 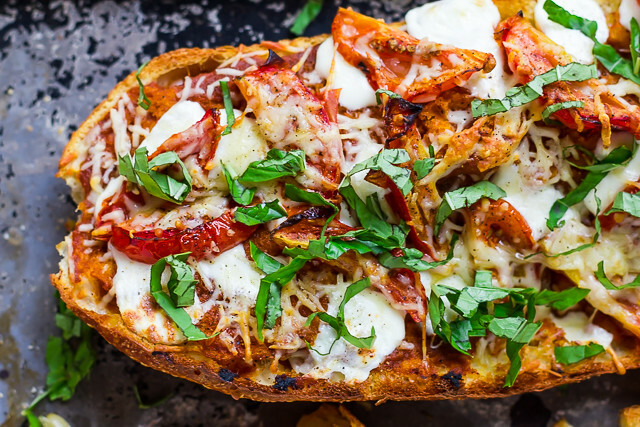 Definitely need to try this for dinner! I love how easy and tasty this looks! Hey there – I think I live near-ish you… What is this pizza place you speak of?? Mod Pizza – it’s at Dairy Ashford & Memorial. Also try Locatelli’s – at the same intersection, over by the MAC. What a great idea! So much more simple than making the dough. And the margherita toppings look so delicious! I have totally already delved into tomatoes and mozzarella…and roast garlic sounds like the obvious perfect NEXT STEP. Love this pizza!